Jim Hendry giving the opening address. 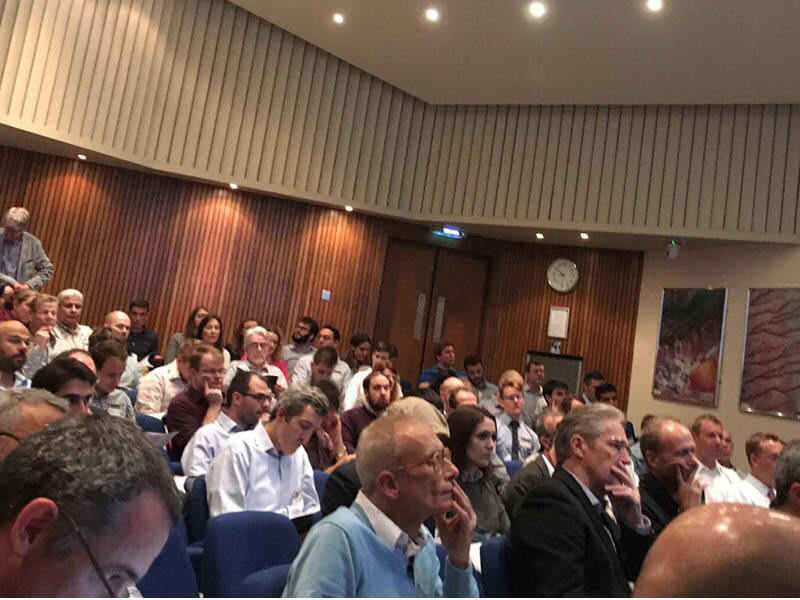 In October 2018 the Geological Society of London hosted a conference focused on seismic characterisation of carbonate platforms and reservoirs, with strong attendance from industry and academia. Seismic geomorphology and seismic facies applied to carbonate depositional processes and products. It was generally agreed that a conference with this theme was sorely overdue. All the participants were actively engaged in the Q&A sessions either directly after the talk, or during the discussion time at the end of each session. The conversations didn’t stop during the breaks, or at the end of the first day. At the conclusion of day 1 the registrants were treated to a “hot fork buffet”- a term new to many in attendance. Applications to specific assets and exploration areas that were of interest to a broad cross-section of attendees. The assembled delegates at the conference, which was held 11 -12 October 2018 in Burlington House, Piccadilly, London. There were four keynote speakers, each of whom managed to showcase innovative ways to approach carbonate seismic interpretation. James Bishop from Chevron discussed the integration of image log bed dips to validate the clinoform orientations and platform architecture, while Shell’s Manuel Poupon gave a retrospective view of workflows developed to capture the complex morphology of carbonate depositional systems. The Total perspective on improved imaging and interpretation of carbonates for exploration and development was given by Jeroen Kenter, and the final keynote talk came from Lars Reuning of RWTH Aachen University, who discussed the identification of ooid ‘dune fields’ in 50-300m of water, currently located downdip from the relict platform margin. However, the content of the remaining talks was equally compelling, and the organisation of the thematic sessions was easy to follow. Authors presented studies from many key areas of the world where there is either active exploration, or reservoir development (i.e., Pricaspian, Barents Sea, Middle East, Caribbean, Brazil, and broader ‘Australasia’), or where regional-scale seismic volumes allowed us to develop high quality analogues, where non-productive carbonates have been imaged and analysed. In this latter case we saw several talks which utilised publicly available datasets from north-western Australia that provide phenomenal reservoir architecture analogues. Johnson engaged with the audience to frame both the positive points (the ‘plusses’) and the key learnings that could be incorporated at a similarly themed future conference (the ‘deltas’). We will briefly summarise the outcome of that session in the below. 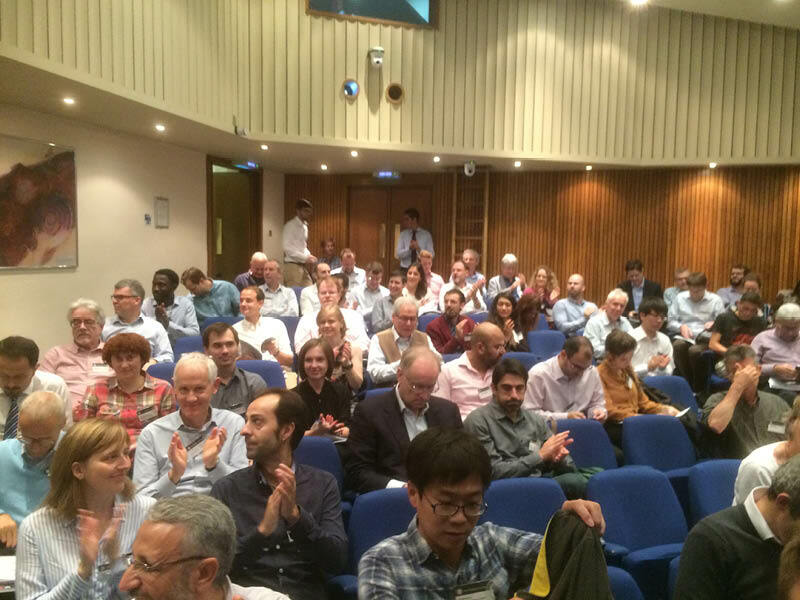 The assembled delegates at the conference, which was held 11 -12 October 2018 in Burlington House, Piccadilly, London. Value of integrated multidisciplinary studies (sum > parts). Direct application / validation of ‘things we are seeing’ in our data. Would have been good to see more on rock physics and on QI (AVO/EEI) in carbonates. The question(s) asked were: (1) When does it work? (2) Is it viable without well data? 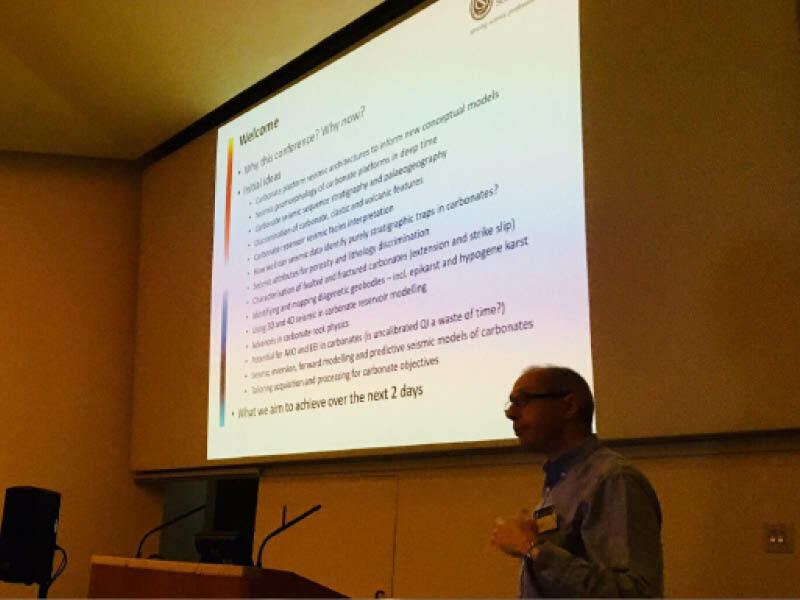 Importance of critical evaluation – don’t take seismic on ‘face value’; explore alternative models, iterative hypothesis testing, validate with well data. The importance of involving interpreters (and geologists) in survey design and parameterisation prior to acquisition, was addressed. If the orientation of a trend is known from earlier 2D or 3D, then this should be factored into the acquisition design when a new survey is planned. In conclusion: as the first event in a number of years to showcase this theme, this was a very well attended conference, with strong representation from academia and industry. It is hoped that there will be an appetite to host something similar in the future. Some recommended GEO ExPro articles related to, or similar in content to, carbonate reservoirs in petroleum geology.